Despite its bright, bold coloration, diurnal (daytime) habits, and strange, beetle-like or wasp-like appearance, the Veined Ctenucha (Ctenucha venosa) is actually a moth. 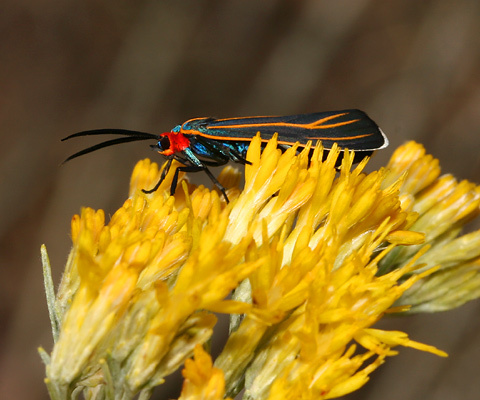 Here in North America, Veined Ctenucha moths are found mainly in the southwestern United States and in Mexico. 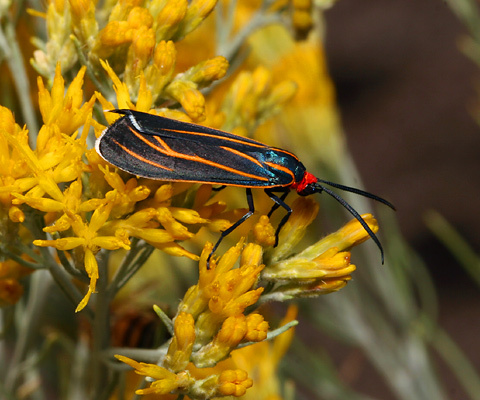 In early November of 2007, I spotted this Veined Ctenucha moth and several others visiting autumn-blooming flowers along the San Pedro River in St. David, Arizona. Compared to butterflies, Veined Ctenucha moths are fairly small, and although they can have an up to 1.6 inch (4 cm) wingspan, they usually keep their wings folded flat against their body, which makes them appear smaller. 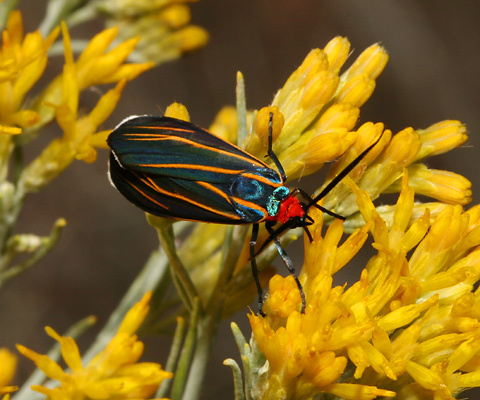 Veined Ctenucha moths have a fuzzy, scarlet head, black antennae, an iridescent blue body, and brownish black wings with discontinuous white wing fringes and three orange veins (one is branched) on the forewings. Veined Ctenucha moths look very similar to another Ctenucha species, C. cressonana (no common name), but Veined Ctenucha moths are smaller, don't have unbroken white wing fringes like C. cressonana, and have three orange forewing veins instead of two yellowish forewing veins like C. cressonana. Here in the Sonoran Desert, Adult Veined Ctenucha moths and other diurnal Ctenuchid moths are the most common in the autumn before the first frost. These small, dark moths are generally seen visiting fall-blooming flowers along with late-season butterflies. The fuzzy, black and yellow-striped Veined Ctenucha caterpillars feed on the abundant late summer grasses that appear after our summer monsoon rains.